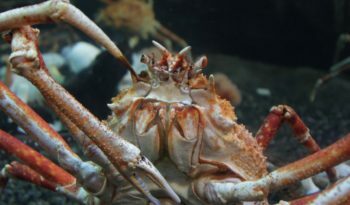 Crabs are crustaceans and related to lobsters and shrimps. 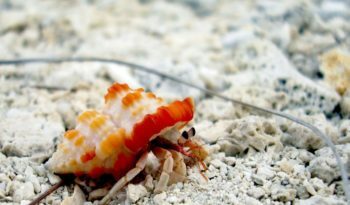 There are almost 5,000 different species of crabs, about 4,500 are true crabs, plus around 500 are hermit crabs (hermit crabs do not have a very hard shell and use other animals old shells for protection). 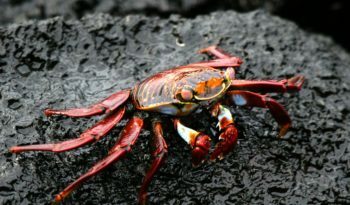 However, crabs have evolved so that they can walk or run sideways, as well as burrow and swim. The body of a crab is covered by a chitinous shell called a carapace. A crabs abdomen has become fairly reduced and is tucked under the body. 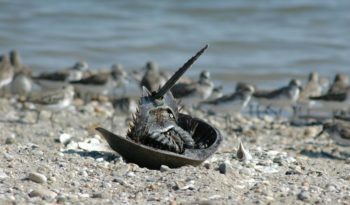 This reduction is greatest among the ‘true crabs’, which lack the flaplike tail of the hermit crabs and their allies; instead, the abdomen serves as a brood pouch for the eggs. A crabs segmented body has several pairs of appendages, of which usually five pairs serve as walking legs and two as sensory antennae. The pincers of a crab, called chelae, are located on the front legs and are used for fighting, display and feeding. Crabs can possess fairly complicated nervous systems and are considered to be more advanced. 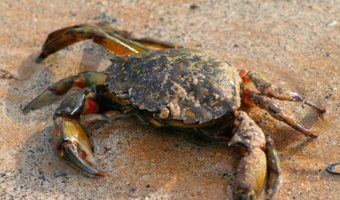 Crabs can live in more extreme areas because of their ability to adapt well to the changing environment. Crabs can see fairly well with their compound eyes. Their sense of smell and taste are also more advanced which helps them to find food and mates easier. Reproductive and social behaviour sometimes include complex mating rituals and communication techniques such as drumming or waving the pincers. 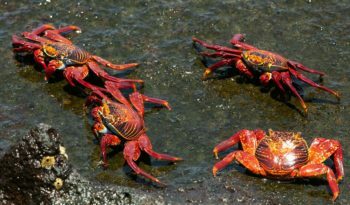 Crabs tend to be aggressive towards one another and the males often fight to gain access to the females.